Does this picture capture your spirituality? Satan. Lucifer. Beelzebub. The Anti-Christ. The Accuser. The Tempter. The Prince of Darkness. The Son of Morning. The Evil One. The Serpent. These names, along with many more, have been the focus of many sermons throughout the years and the spiritual focus of many Christians. Stories have been told about the power of evil and the temptation of its crafter. Many have been moved to act, even change their entire lives, because of fear instilled in them by such teachings. For some, the image of this being is the keystone of their faith, dictating every aspect of their spirituality. Some will tell you emphatically that the Devil does not exist, that it is simply a mythological character or a manifestation of the bad things we do to one another. Fine. 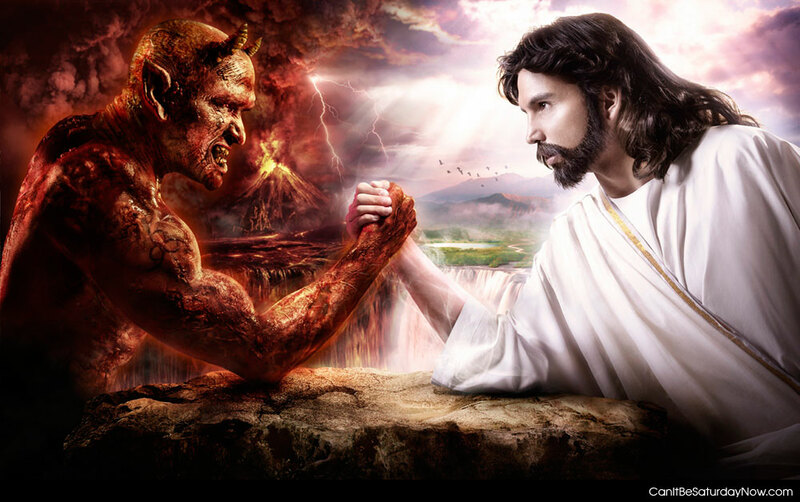 Others will tell you that Jesus talked about the Devil and demons, that “the greatest lie the Devil ever told was convincing the world that he did not exist.” Great. Still more will tell you that “Foosball is the Devil.” Good for them (and good for you if you caught the reference!) For me, it makes no difference in the world: the existence of the Devil bears absolutely no weight on my spirituality and I refuse to ever devote time to thinking about it or coming to any conclusions on what attributes it/he/she/they may have. For me, the Devil has only one name: the Irrelevant One. If God is the creator of the whole universe and everything in it, is all powerful, omniscient, and ever present, is the source and focus of our eternal salvation, and existed before all else, then goodness must predate evil. If the Devil were to exist, its/his/her/their presence would only matter in relationship to God. Because I can have God without the Devil but I can never have the Devil without God, the Devil is irrelevant to me. All that could ever matter is to love God, to be in perfect relationship with the one that created us. So what if there is another creature created by God that wants to prevent us from such a relationship? Do we honestly believe for a second that this creature could have power over God? Do we honestly believe that this creature could make us do something against our will? If even God does not have the power to limit our free will, it seems a bit silly to me for us to worry about some lesser creature that only has the power to tempt us. For this reason as well that the Devil is irrelevant to me. Sister Aloysius Beauvier speaks a powerful truth even if she doesn’t understand its importance: to take a step toward evil, even to fight it for the sake of God, is to take a step away from God. I ask, why would we ever want to do anything that would take us away from God? There is nothing more important, nothing that could ever make us want to be separated from him. But that is what fear of the Devil, or in my opinion, any attention at all to the Devil, does to people. When we take time to think about, fight against, contemplate, or hate the Devil, trying to define it/him/her/them or know more about it/him/her/them, we spend time with something that by it’s very nature cannot bring us closer to God. This, I would say, is the very essence of wasting time and something I don’t have time for. So what the Devil are we doing spending so much time on a useless topic? I don’t know. There is an obvious irony in spending 853 words talking about how the Devil is not worth talking about, but I hope that the more important message is what you will remember: there is nothing worth your time more than God. Turn to God and God alone. Very thought-provoking argument.. I am going to have to ponder this one for a bit. First time commenting, but have been following you for a bit now and always enjoy reading your take on things. I do lean toward the “the greatest lie the devil ever told” line of thought, but you are definitely right about his irrelevance in the end calculation. We also have to remember that St. Paul also encouraged us to continue in the struggle in Ephesian 6:10-18. The difference is in the source of our victory – our selves or our God? Do we use our words, or the Word? Excellent thoughts, brother! I, too have spent time learning about how to do “spiritual battle” against the enemy of my soul. But after reading your words, I have come to realize that the Lord has been leading me to just follow Him, listen to the small, still Voice and count all as naught except Him in my life. I have been greatly blessed these past 2 years to be a partner in ministry with Fransciscans of the Holy Name Province and working in the Lord’s house has been my greatest blessing.